Confused.com is extending the range of free toys it offers customers who take out insurance through the company after the success of its Brian the Robot mascot. Toy versions of Miss Herbert and Stunt Herbert, the sidekicks to Brian in its adverts, have been launched and customers are being provided with more opportunities to claim the toys. Confused.com's initiative follows the popularity of the meerkat toys offered by rival price comparison site Comparethemarket.com. 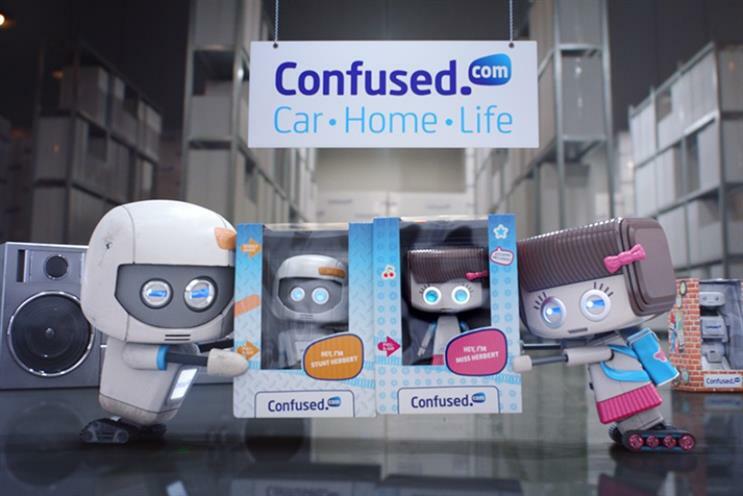 Customers who take out car, home, life, van, motorbike or pet insurance or a credit card through Confused.com can choose one of the three collectable toys. Confused.com head of advertising Fiona Creedon said: "Since the launch of our Brian the robot toy we’ve seen his popularity soar and felt it was time to expand his family." In order to support the launch of the two new toys, Confused.com has unveiled a new 30-second advert, in which Stunt Herbert and Miss Herbert’s sibling rivalry is revealed as they show off their toys. The Herbert characters were first seen coming to the aid of Brian when he was captured by metal scrapyard dealers last Christmas. The toys have been developed by promotional marketing agency ATOM Marketing. Confused.com is also sponsoring the second series of ITV show Ninja Warrior UK with idents that features the Herberts. Social media activity is also being used to support the campaign and features consumers being asked to pick either 'Team Miss', 'Team Stunt' or 'Team Brian’.